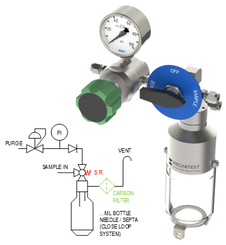 Mechatest Bottle Sampler with Back Purge configuration is a combination of a 3-way valve, liquid bottle sampler and purge system. 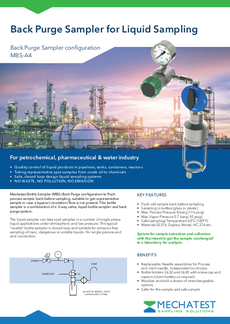 Based on single process, sample flow back purge and vent connection. 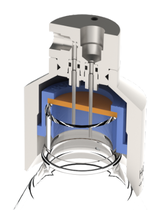 The better solution for representative sample take-off when bypass flow is not possible. Single handle operation with an instrumentation (small volume) 3-way valve, this back purge sampler enables to purge with inert gas the sample flow backwards, if a bypass (circulation) sample flow is not possible you need to refresh and flush old sample back from all the dead volumes in the sample system (sample transport line, process valve and sample probe) After back purging the sample system will fill with new sample and the collection of a representative liquid process sample can be done, typical for applications where bypass sample flow is not possible, direct mount to the process pipeline or an easily accessible workplace for operation or laboratory personnel. 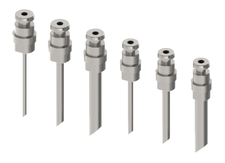 The back purge sampler is a good solution to prevent dead volume of sample. 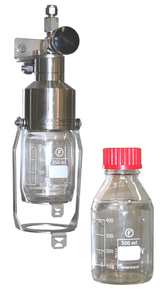 Easy sampling procedure, turn the sample valve to BACK FLOW, the purge gas will push the old sample back, after certain time turn the sample valve to SAMPLE, the sample will flow into the sample bottle under system pressure, while air and gasses in the bottle are vented through the vent connection. When the required volume of approx. 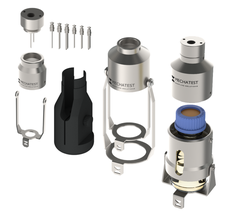 80% of the bottle volume is taken, turn the sample valve in OFF position, the sampling procedure is completed.